Beautiful animation? Check. Amazing fights? Check. Though-provoking conflict? Check. Looks like we’re good here. At the end of the first season of Unlimited Blade Works, things looked like they couldn’t get any worse. Caster not only defeated Shiro, Rin, Saber, and Archer, she also managed to take Saber’s bond from Shiro, becoming her new master. Moreover, the now nearly useless Shiro was rejected by Rin who set off with Archer to fight Caster alone. It looked like the low point for our heroes. But brilliantly, it wasn’t. Not even close. The first part of the second season is spent showing just how much worse things can get. Archer defects, allowing Caster to become his new master. Shiro and Rin, seeking allies, try to get Berserker to help—only to watch Berserker and his master get killed right in front of them. With nothing else left to lose but their lives, the two prepare to fight Caster, her master, Archer—and possibly even Saber. The fun of heroic narratives comes from watching the heroes face and overcome various obstacles. The trick, however, is to make the obstacles seem insurmountable, yet at the same time, make it believable within the context of the story’s fictional universe when the heroes win. Unlimited Blade Works excels at this—never falling back on tired plot devices like the deus ex machina to achieve victory. While Shiro specifically does power up massively over the course of the story, he does so slowly and logically—well, logically in a world with magic, anyway. Moreover, there are major downsides to his increase in power which are not so easily swept under the rug. Despite the seeming importance of the battle for the Holy Grail, Shiro’s future is really the main focus of Unlimited Blade Works. The twist of the whole story is that Shiro and Archer are the same person—with Archer being Shiro’s future self. Shiro has a self-sacrificing personality—to an extreme degree. Basically, he never says “no” to anyone requesting his help—even if he is basically being exploited or abused. This is due to his view on what makes a hero: a selfless person who does everything possible to save as many people as possible. After spending his whole life as a tool, one that kills people to save others, he becomes a heroic spirit and then finds himself as a pawn for killing once again. Eventually, he comes to hate himself—especially the self-sacrificing fool he was in his youth. However, the battle for the Grail gives him a unique opportunity—to kill his past self and possibly spare himself of his eternal torturous existence. The feelings behind Archer’s plan are easy to empathize with. After all, who doesn’t dislike who they were—or at least parts of who they were—when they were younger. Everyone has regrets, after all. Yet, at the same time, we want Shiro’s ideals to be correct—to believe that a true hero can exist. It makes for a compelling clash of ideals. Of course, in the end, the Shiro of the present refuses to give up on his goal to be a true hero—even while knowing where he will end up. And by defeating Archer, he seems to ensure the time loop is fixed and nothing can be changed. This makes for an excellent bittersweet ending. Rin, of course, doesn’t want the man she loves to end up tortured and alone—and it’s not like Shiro particularly wants that fate for himself either. However, he does feel that his path is still the right one. However, the story does give hints to keep the ending somewhat hopeful. Archer never mentions falling in love with Rin when he was younger. Moreover, Archer states that he received the Unlimited Blade Works upon his death—yet Shiro has it by the end of the anime. With this extra fantastical power and Rin by his side, perhaps his fate isn’t as set as he fears. One of my favorite parts of Unlimited Blade Works is the final episode. In most anime, the final episode serves as the show’s climax—where the final battle is fought or the grand romantic gesture is finally made. However, in Unlimited Blade Works the last episode isn’t the series’ climax, but rather a 22-minute epilogue showing where Rin and Shiro end up a few years down the line. Instead of a sudden, jarring end, we actually get to spend some time on what the future holds for our characters—and how the driving conflict affects the two in the long run. I truly wish other anime would give us this breathing room at the end to decompress instead of cramming in a short epilogue as the credits roll. Of course, the back half of Unlimited Blade Works isn’t perfect. The pacing gets to be a bit drawn out as Archer and Shiro’s philosophical debate spreads across several episodes—seemingly retreading things that have already been said before. But the biggest problem with Unlimited Blade Works comes from its source material. Unlimited Blade Works is just one third of Fate/Stay Night—one of three ways that the story can unfold. Because of this, there are major questions and character motivations set up in Unlimited Blade Works that are never explained. In the original visual novel, these mysteries and backstories are explored in the other versions of the story. But if Unlimited Blade Works is your first look at the franchise, these stand out as particularly glaring plot holes. Fate/Stay Night: Unlimited Blade Works is a beautiful-looking anime—which I have pointed out at length before. But just like with the first season, this anime once again proves to be far more than just eye candy. The plot’s tension is beautifully handled and the conflict between two versions of the same person is thought provoking. And if you are looking for some of the most striking and breathtaking anime fight scenes around, you have most certainly come to the right place. 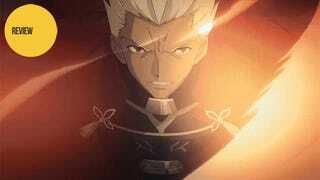 Fate/Stay Night: Unlimited Blade Works aired on Tokyo MX in Japan. It is currently available for free and with English subtitles on Crunchyroll, Daisuki and Hulu.